Lochaber Geopark Geology Group: Excursion to Allt a’ Mhuilinn. The next LG3 excursion, on Monday, 17th October, is to the Allt a’ Mhuilinn, a footpath leading to the CIC hut below the North Face of Ben Nevis. Meet at the Ben Nevis Highland Centre, Nevis Bridge, Fort William (the old ‘Woollen Mill Car Park’), at 10.00, to share transport. Be aware that there are no ‘comfort stops’ on this excursion! We will then drive to the North Face Car Park, Torlundy, where we will leave our transport. We expect to be back at the Ben Nevis Highland Centre about 16.30. 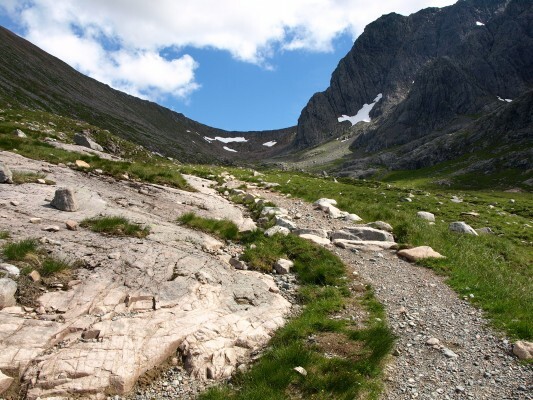 The route crosses the igneous rocks that form Ben Nevis (diorite, outer and inner granites, and andesites). The scenery is excellent, great views of the North Face of the Ben, with good wildlife watching opportunities. It is about 3 miles up and the same back, using a well-made path. Short digressions will be made from the path to look at rock outcrops, mainly in the burn bed. Usual requirements; walking boots, walking poles, waterproofs, midge repellent(? ), packed lunch, cameras, binoculars, etc. Cost: own transport costs and cafe bills; £5 per person donation to Lochaber Geopark.